it's always fun for kids to play dress-up. i don't think many kids today have been to a real circus anymore, but our parents took my sister and me to many traveling circus shows. then we'd come home and play circus ourselves. and guess what – there was no circus director that we played that did not wear a neck tie! 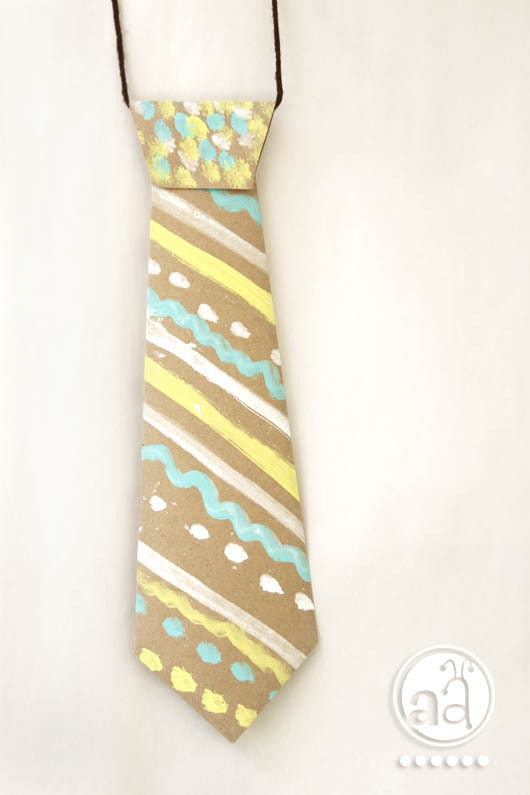 this is a step by step tutorial on how to make a diy paper neck tie. 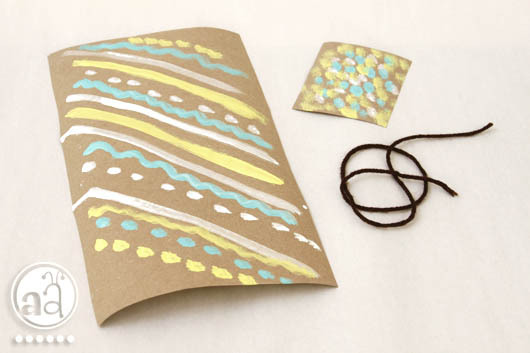 get creative on how you and your kids can decorate it: colors, glitter, stickers – anything goes! 2) decorate the paper any way you like, i used acrylic paints. 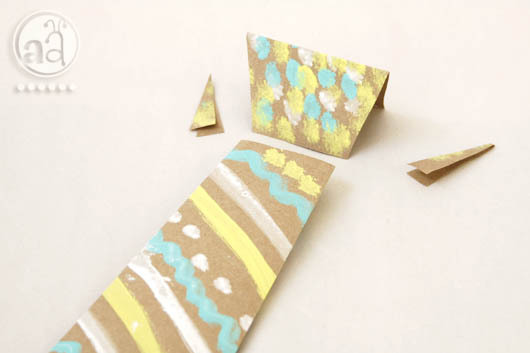 3) fold the bottom of one paper into a pointed edge as you see it above. you might want to use a "real" tie for reference. i marked the upper side of the paper with arrows, this was to indicate how wide i wanted the tie to be at the top. 4) then i folded the sides from were these arrows are down to the pointed edge (this determines how wide you want the tie to be from top to bottom, it gives the tie the final shape). in the picture below you can see how i needed to fold over one of the side flaps twice so it won't overlap and be visible from the front. 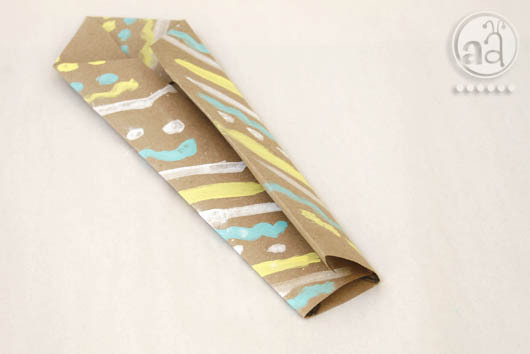 5) to make the "tie knot": fold the smaller paper in half. 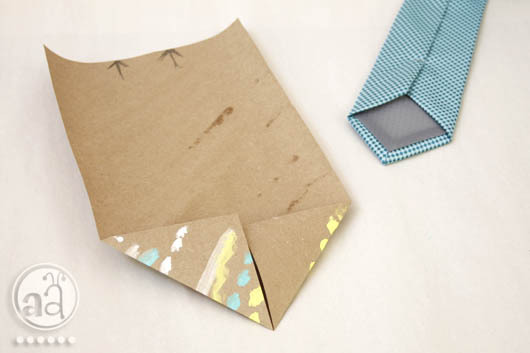 then trim off triangles to make the opening side as wide as the top part of the tie. this gives the "knot" a more realistic shape. 6) place your string or elastic into the fold of the "tie knot", then fold it over and glue the upper flap onto the front of the tie – and the back flap onto the back of the tie (see picture below). now you and your kids can show off your brand new designer fashion (or find a furry friend to model it off as i did). hey, i love this! so cute and stylish! 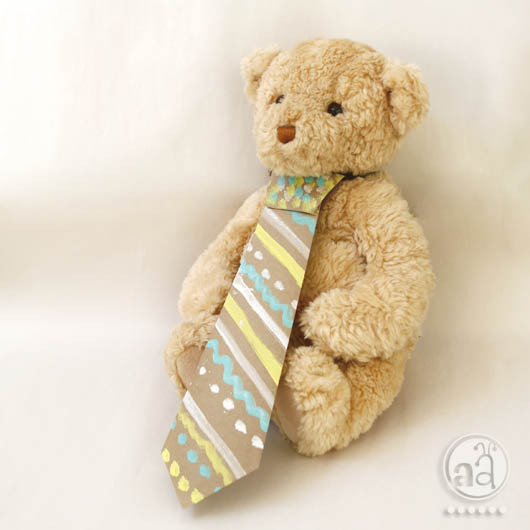 and it suits the teddy very well too! Oh, Simona, that tie is sooo cute. Can''t wait, until I can make one with little Spencer! 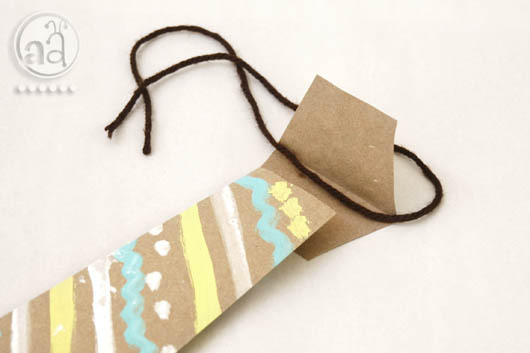 I think this is such a great idea and I featured it on The Crafty Crow for Father's Day! @ Owner: Thanks for the feature! It's a simple but fun project, isn't it? !